I can’t really recall the first time I had Chicken Fried Steak… Probably either at my grandmother’s or at Auntie Sis’ as a little kid. My mom made it once every blue moon or so (with six kids, even cheap steak was a rarity at our house!) and I definitely had it while in the Navy. (LOTS of Southern boys in the navy, ya know?!?) I remember vats of country gravy and sheet pans stacked high with greasy steak. The vinyl booths, the long counters and the 70’s decor only enhanced the dining experience. And the waitresses – either 50 year veteran’s who cold work a dozen tables without breaking a sweat – or, later, 20 year old Filipina’s who were extremely friendly, if somewhat absentminded – were the icing on the cake. I guess this would be a good point to explain to some of you just what Chicken Fried Steak is… It seems that since moving east, up here above the Mason-Dixon Line, there’s nary a soul who knows what it is! Quite simply, it’s a piece of steak – beef steak – that is fried as one would fry chicken. In the olden days, one would take a cheap cut of beef, flour it, and pound it with a Coke bottle to tenderize it and incorporate the flour. Then fry in fat and smother in cream gravy. I generally use cubed steaks… It is dredged in flour (and I then dip in egg and then dredge in flour, again) and then fried in fat. Oh yum. 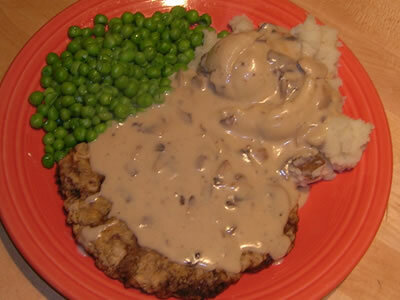 Of course, it’s not complete without Counntry Gravy – cream gravy, sausage gravy… and mashed potatoes. Cardiac heaven on a plate. The best gravy is made from the fat drippings in the pan, of course. Otherwise, why bother?!? And a whole bunch of mashed potatoes! There’s as many variations on a theme as there are folks who cook it. 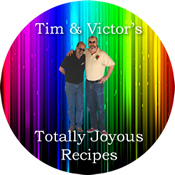 It’s the type of recipe that is usually made the same way Mom made it… And it is distinctly Southern (and Western) in nature… Where did it originate?!? Plenty of people claim the honor, but it’s been around a long, long time…..
And I’ll be making it for a long time, too…..